Red Cross founder, Clara Barton was friends with local residents, Dr. Joseph Gardner and his third wife, Enola Lee Gardner. Before she married Dr. Gardner, Enola Lee was Barton’s secretary, and the two had become friends. In 1888, Enola Lee told Barton that she was going to marry Dr. Gardner, but she promised Barton that she, along with her new husband, would continue to work with Barton anywhere they might be needed. This bolero was a Christmas gift to Enola from Clara. A quilt created in 1917 by local women as a fundraiser to assist soldiers during World War I. It was donated to the museum in 1937 by the estate of Nora Clara Kelly. 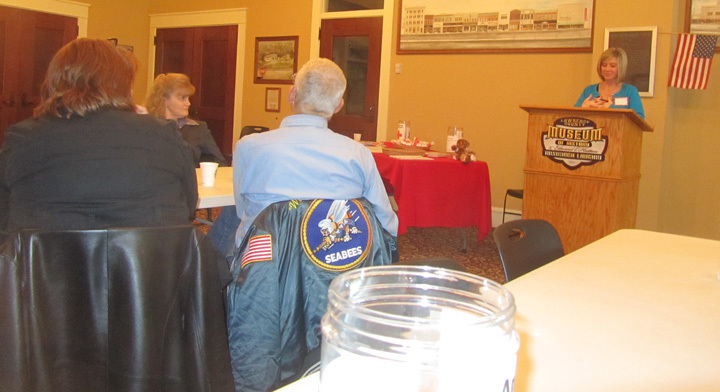 During the reception, Oakleigh Westfall discussed his Red Cross volunteer activities.